The current generation of Southerners have grown up after the Civil Rights era but surrounded by Confederate Flags, so they often don’t understand the real history of the Confederate Flags. That misunderstanding is made even worse because they are often taught a wrong version of history, as I discussed in my previous post Confederate Myths: It Wasn’t About Slavery. To them, they are honestly saying it’s about “Heritage” but they just don’t realize that their Heritage is a Heritage of Hate, Racism, and White Supremacy. Before I talk about the history of the Confederate Flag, I’d like to take a moment to talk about the Confederate Flag supporters themselves. The aforementioned Old Dixie FB page kept ringing the “we’re not racist” bell over and over, but they really hated it when I would take screenshots of comments posted by their members which showed the racism all over their page. Whenever I would post one of these screenshots, someone would inevitably respond with “don’t judge us by one person” to which I would then post 3 more screenshots of other commentors and ask them if they’d like to say, “don’t judge us by four people” because if they did, I’d be happy to keep posting more and more of them. They reported me for “harassment” when I posted screenshots of people’s comments, so that was fun. Let’s be clear, these Confederate Flag supporters are totally not racist. Totally. I can’t link you to this last one because when they blocked me all of my comment threads disappeared from their page. Ok. Let’s talk about the “Confederate Flag”… and by that I mean 4 Flags. What most people consider to be the “Confederate Flag” is actually a rectangular version of the Army of Northern Virginia battle flag. (or potentially the 2nd Confederate Navy Jack… but that’s obscure.) It’s not the flag that represented the Confederacy itself, it was the flag of the particular army commanded by General Robert E Lee. There were 3 flags over time that were the official flags of the Confederacy. Initially, this was the official Confederate Flag after the final number of stars on it had grown to 13. However, many Confederates felt this flag looked too much like the Union flag and pushed for a new design… and what a design it was. Hold on to your butts. Seriously. It doesn’t get much more racist than that. In addition to being super racist, William T Thompson was also a bad designer, because The Stainless Banner had a fatal flaw. Unless the flag was flying in high wind so you could see the Battle Flag in the corner, it mostly just looked like a white flag of surrender. So, in 1865, about a month before General Lee surrendered, the Confederacy instituted a new flag, The Blood-Stained Banner, with a red stripe along the end so it didn’t look like a white flag of surrender. 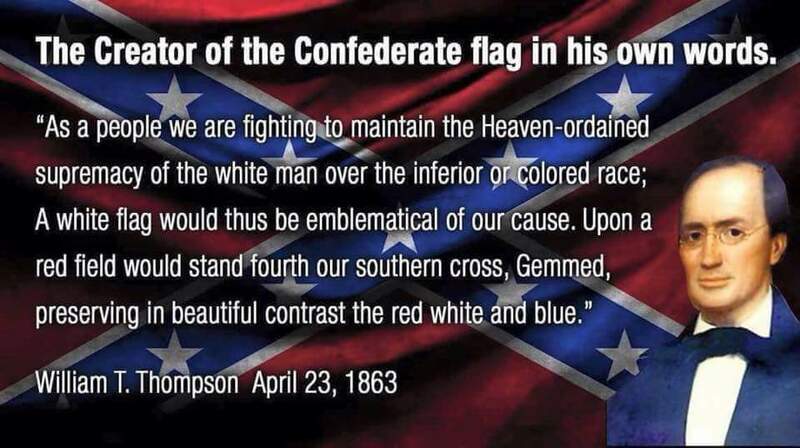 The actual Confederate Flag was explicitly designed to be a symbol of racism, and the Battle Flag represented the army fighting to support the racist Confederacy. There is no grey area here. We stand for the segregation of the races and the racial integrity of each race; … We oppose the elimination of segregation, the repeal of miscegenation statutes, the control of private employment by Federal bureaucrats called for by the misnamed civil rights program. We oppose and condemn the action of the Democratic Convention in sponsoring a civil rights program calling for the elimination of segregation, social equality by Federal fiat, regulations of private employment practices, voting, and local law enforcement. The Dixiecrats used the Confederate Flag prominently in their political campaigns against Civil Rights. As the Civil Rights fight ramped up during the 1950s, more and more racist Southerners who opposed equal Civil Rights took up the Confederate Flag as their symbol to rally behind… just like someone in history had created a flag specifically to be an emblem of their effort to maintain white supremacy… (pssst, it was the super racist guy above). It was used as a symbol to unite those opposed to equal rights for black people. Again and again we see how the Confederate flag has been used throughout time. It was first used when fighting to own black people. It was then resurrected when fighting to deny rights to black people. The Confederacy stood for white supremacy. The Confederate flag is, and always has been, a symbol of white supremacy. It’s racist.